WriteBonnieRose gave me the chance to read her Level 1 of Learning About Science Collection. This is an e-book which you can download and print. This is geared towards younger elementary kids. It contains life science, earth science, and physical science. There are seven books in this collection. The books study how plants grow, common fruits and vegetables, animal habitats, senses and body systems, life cycles, the earth’s layers, earthquakes, volcanoes, states of matter, and more. We started with common fruits and vegetables. The pages start with a snip about the vegetable as well as a picture that you can color and the name that you can trace. There are Review sheets at the end thst work well for 1st to 3rd grade. The collection is 172 pages long. I think the tracing the word and the coloring is good for the younger kids but they may or retain well the information about the vegetables. But the review pages are better for older kids, but they probably wouldn’t be interested in tracing the words. The earth science one does not talk about the creation of the earth so it can be used for Christian or secular learning. I ended up using the coloring and the tracing of the words for my 4 year old but my 3rd grader did the review sheets. I do think this are good for a guide to lead some learning. There isn’t a whole lot of depth to them and can be done quickly each day. However if you use them as a starting tool and add some activities in with it you could use it as your main science learning. Like the plants leason teaches about plants and all their parts and how they grow. So adding in an activity of growing your own plant would be fun. You could even bring in plants you find in your yard and identify the parts of them in real life. The possibilities are endless when you put some effort into it. Which really help with kiddos that are more hands on learners. It also helps teach a bit of a age range of kids at the same time. We really did enjoy this and we plan to continue on through the other subjects. Also, I have a special offer for my readers! 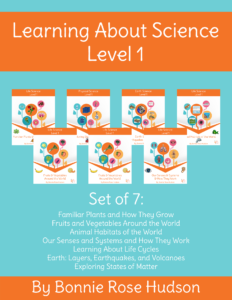 You can save 50% on the bundled Learning About Science, Levels 1, 2, and 3 with coupon code REVIEWCREW50 through August 15, which means they can get each set of ebooks for $6 per set at https://writebonnierose.com/products-science/. Also check out what my other crew mates had to say about this level as well as the other levels offered.